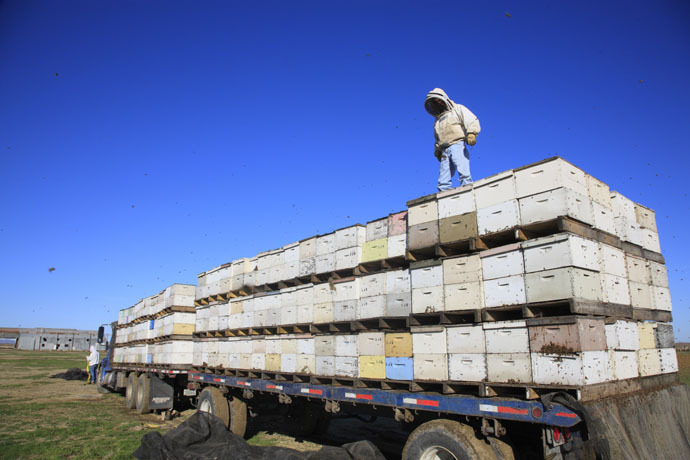 There are an estimated 115,000 – 125,000 beekeepers in the United States. The vast majority are hobbyists with less than 25 hives. Commercial beekeepers are those with 300 or more hives. Men and women that keep hundreds or even thousands of honeybee hives do so as a full time job. They depend on their honeybees for most or sometimes all of their income. Commercial beekeepers will produce large amounts of honey to bottle and sell, rent their hives to growers for pollination, raise honeybee hives to sell to new beekeepers, or sell other products produced by the honeybees. Commercial beekeeping operations are frequently family businesses that are handed down from generation to generation. Their job is so important because all of the world needs to eat. Many of our crops have to be pollinated in order for them to grow and produce. Pollination is the single most important service that honeybees provide for us, and commercial beekeepers are responsible for a large portion of that! Pollination is the fertilization of plants necessary to produce nuts, fruits, and even seeds. For a plant to be pollinated, the pollen grains need to be moved from the stamen (the male part of the flower) to the pistil (female part of the flower) so that fertilization can occur. There are many different animals and insects that pollinate plants. Honeybees are especially good pollinators because pollen is their main source of protein. They need protein just like you and me do to grow healthy and strong. As they travel from flower to flower collecting pollen to eat, they pollinate our crops. 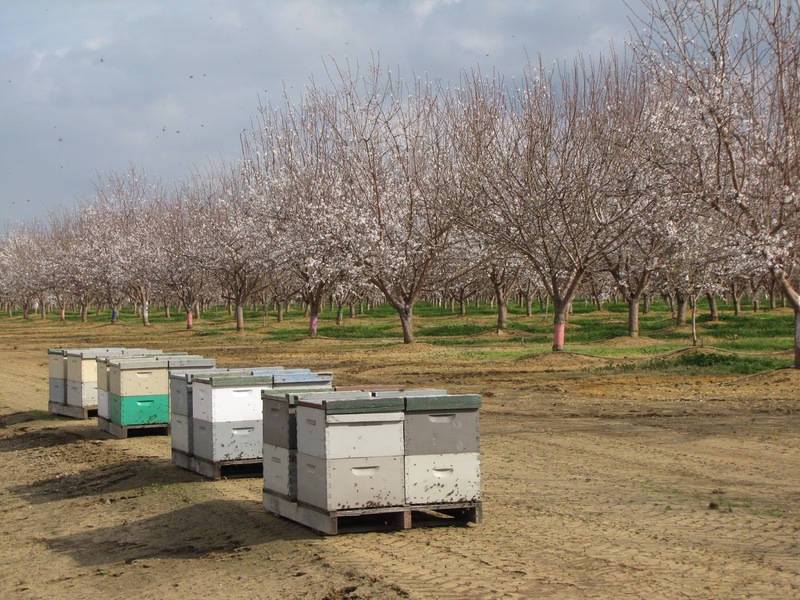 Many commercial beekeepers migrate their colonies during the year to provide pollination services to farmers and to reach the most abundant sources of nectar. There is a special type of commercial beekeeper called migratory beekeepers. Beekeepers who “migrate” move their honeybee hives all across the country so that their honeybees can pollinate crops. These beekeepers have to plan and prepare plenty of time in advance. The honeybees are moved at night after the foragers have returned to their hive so that honeybees will not be left behind. To ship the honeybees, the beekeepers load the hives onto large flatbed trucks (450 hives per truck! ), and the bees are then driven to crops which need to be pollinated. 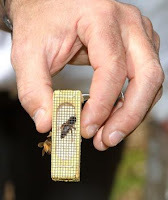 Another very important part of commercial beekeeping is buying queen bees. When the bees travel around the country, the queen bee has to be replaced more often. The queen bee in a honeybee hive is the mother of all the other bees in that hive, which makes her the single most important bee in the entire beehive. Because the queen is so important, there are beekeepers who focus just on producing new queens. Queen rearers focus on raising and breeding healthy new queens to keep hives strong. The queens are shipped to beekeepers all over the country once they are ready to begin their duties in the hive. The commercial beekeepers get these queens in the mail and then put them into their hives (we call this re-queening). This keeps the hives healthy and strong, ready to be most productive at their job of pollinating. Commercial beekeeping is important to every single one of us! Without honeybee pollination, we would not have 1/3 of the food we eat!